Intersection of SE 85th and Division. One person died and another person was taken to the hospital suffered minor injuries after a hit-and-run in Southeast Portland early this morning. The Police say the collision happened around 1:00 am this morning on SE Division at 85th. After arriving on the scene the officers discovered the suspect vehicle dumped at 92nd and Southeast Powell Boulevard. They are still searching for the suspect, whom they describe as a male, Hispanic 5’6 inches tall weighing about 160 pounds and may have been wearing a hat. 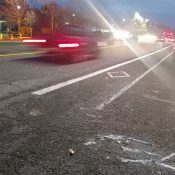 During a ride on Tuesday with the City of Portland’s Bicycle Advisory Committee, we learned that SE Division (which is a wide, high-speed, five-lane arterial with standard bike lanes) is slated for bicycle safety improvements. PBOT plans to install buffered bike lanes on Division from I-205 east to SE 130th and “better bike lanes” from I-205 west to about 77th. This is the first fatal bicycle crash in Portland this year. There were no fatal bike crashes in 2010. The investigation is ongoing. If you have any information regarding this collision, please call the Portland Police Bureau at (503) 823-3333. Stay tuned for updates. UPDATE: KOIN reports that the police have one person in custody. For major updates, please see this post. 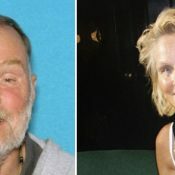 Another week, another hit-and-run in Portland. Like clockwork. My condolences to the family and friends of the victim. And to everyone else, please be careful and be responsible. Seconded- my thoughts & prayers go out to the family and friends of this person. The safety improvements, when they come, won’t be a factor on the stretch of Division where this happened since it’s west of 205. I ride this way often, either to reach the MAX or the I-205 path. It’s very common for drivers to straddle the bike lane, or weave back and forth around bikers. There’s never any lack of aggression, is there? Even though this is the first one this year and there were no last year, one is always one too many! Condolances to the friends and family of the victim. And, may the injured cyclist have a very speedy recovery. And, hopefully since they found the vehicle, it makes it easier to find the perp. I wonder if the car was stolen, or if they will be able to track down the driver through vehicle registration. I suspect it was stolen, since it was dumped. You don’t generally try to dump your own car. Unless you are intoxicated maybe. What’s worse, DUI + hitting someone, or a “sober” hit and run? Oh, they had a lot to blame: Curfew, bikes don’t belong…, riding not safe, => It’s all the rider’s fault! How dare we even exist! Isn’t 77th west of I-205? Where will these “better bike lanes” be? Yes, they mean from 205 (which is about 93rd or 94th) west to about 77th. 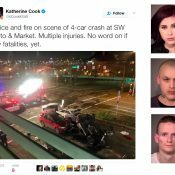 “On Friday, August 12, 2011, at 1:02 a.m. a Portland Police officer was eastbound on Division at about Southeast 85th when he was flagged down by a motorist regarding a bicyclist who had just been hit and run by a black SUV. The officer was also contacted by a 17-year-old bicyclist who had also been struck by the SUV. The 17-year-old was transported to an area hospital but has non-life threatening injuries. The officer immediately requested medical personnel to the scene to treat the downed cyclist but after medical arrived the bicyclist was pronounced deceased. Arriving officers established a perimeter, Southeast Division to Powell, 82nd Avenue to 92nd Avenue. Officers discovered the suspect vehicle dumped at 92nd and Southeast Powell Boulevard. A canine was called to the scene to search for the suspect. The suspect was described as male, Hispanic 5’6 inches tall weighing about 160 pounds and may have been wearing a hat. The Traffic Division Major Crash Team and the Forensic Evidence Division responded to the scene to conduct the investigation. I really hope they catch this guy, and that the second cyclist recuperates fully. My thoughts go out to the family, friends and co-workers of the deceased cyclist. Condolences to the victim’s family and thoughts and prayers to the injured man still in the hospital. May justice for the hit-and-run driver be swift and severe. You know, something really needs to be done about these scofflaw motorists. Don’t get me wrong, I am a driver and I have nothing against driving, but these people I see constantly disregarding the traffic laws really gives us drivers a bad name. I’m sick of seeing people speeding, right-hooking people, not using turn signals, and leaving the scene of accidents. They really ought to consider how they are making the driving community look when they do things like this. Bicycling has made me a better motorist. Ironically, driving has made me a better cyclist. Yeah, it goes both ways because you learn what to watch out for. Sorry for the confusion everyone. My mistakes. I’ve edited the story. PBOT has buffered bike lanes planned for a section of Division that is east of where this collission happened. At the location of this collision, there are “better bike lanes” planned as far as I can tell. thanks. 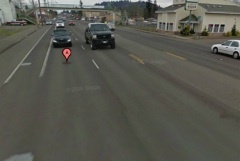 The push-pin in that Streetview gives the impression the impact occurred in the traffic lane as opposed to the bike lane. I don’t think that detail has actually been stated, so maybe that image is misleading and could be changed? KATU has video showing a working rear light on one bike and working front light on the other. Unknown about other lights or reflectors. That piece also refers to BikePortland.org. Donna, vehicle description is black Acura SUV. Condolences to family and friends of the deceased, and best wishes to the injured. Any chance they’ll release a description of the vehicle that was abandoned? Someone might be able to provide the police with a tip about the suspect if they could connect a particular car with a particular individual. Something tells me the PPB have knocked on the door of address the vehicle is registered. My gut tells me he may turn himself after he makes sure he blows a 0.00%. This is provided it was his vehicle. Seems a logical thing to do. Was it mentioned if both cyclists had rear lights? It would be helpful if someday reporters, police, and some commentators didn’t immediately ask whether or not a cyclist was wearing a helmet or using lights. As if it’s somehow the cyclists fault. 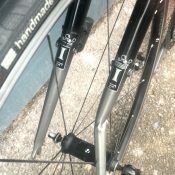 Yes, cyclists should use those things. But a person is dead and that person can’t speak for himself anymore. Based on the early descriptions of the scene it sounds like a helmet wouldn’t had done much good. Helmet or not, night time or not, there is no excuse for a motorist hitting a cyclist from behind. Condolences to the victims family and friends. The excerpt from the Oregonian I posted, said “…severe head trauma. …”. The kind of protection I understand bike helmets are capable of offering a person wearing one, doesn’t, doesn’t include severe head trauma, but may be capable of reducing abrasions and mild concussions. In a collision where the person struck sustained major injuries impact, even reducing the shock of cumulative injuries by this comparatively modest amount, might well be worth the precaution of wearing a bike helmet in terms of people’s ability to recover. This is basic, low cost, protection. Making the observation as to whether a person injured or killed while riding a bike was or wasn’t wearing a bike helmet does not inherently imply that that person was responsible for their own injury or death. It shouldn’t even be assumed that not wearing a bike helmet precipitates conditions leading to injury or death in a collision. What should be understood, is that wearing a bike helmet while biking, in the event of a impact to the head, the bike helmet may very well help to reduce injuries otherwise sustained. The use of a helmet and the use of lights at night are not even comparable choices. One is legally optional and of marginal utility, as shown by study after study that indicates every clear benefit that improves safety is often offset by a cost that partially decreases safety. The other choice, lighting, is required at night and makes a huge difference in visibility and general safety. The use of lights and reflectors at night should always be part of a news story. Helmets, much less so. This is just a general comment – not necessarily related to the current incident. I don’t think people in their comments were actually attempting to compare the type and level of safety that bike helmets and bike lights can offer people that use them, or claim the level of safety they offer to be equal. Each type of equipment offers different kinds of safety, but both are important and basic, very affordable safety gear that anyone riding a bike out in traffic is well advised to consider using. For people deciding whether or not to wear a bike helmet, the key question is simple. Do you want some protection from a bonk to the head, or don’t you? Depending upon the impact, maybe it won’t be much protection, but it’s something. I wonder if there are any statistics available that show the time the bike accident took place versus the severity. It sure seems like there are a lot of bad bike/car accidents that take place after dark but that is just my impression from reading the news an not based on any stats. Yeah Jon, there was another recent incident that occured around the same time in the early morning as this. It doesn’t matter how many lights, bells and whistles you put on your bike. Riding at night is riding at night. MUPs or Segregated Cycle Tracks are the way of the future. Hey Jonathan, so about the second cyclist..really not a serious injury. Actually I sustained very little injury, just a few bumps and bruises. This was far from your general weaving in and out of the bike lane. The SUV essentially came directly into the bike lane, struck the cyclist behind me at full force which catapulted him several feet in front of me.. I was just clipped and just knocked down, I quickly got up, and saw the damage of what had just happened. They did take to me the hospital for a checkover and I was released later that night, now I’m just really sore. This is just too tragic. Brilliant. So only people who can afford to live closer in are allowed to bike? Kevin…sounds as though you’re definitely saying you’re the surviving person that was riding a bike, and was involved in this collision on “…SE Division at 85th. …”. I’m all for people wearing bike helmets in city street situations like this one. By your comment though, you didn’t receive anything close to the kind of injuries the person you were riding with did, and none to your head. The excerpt from the O’s story that I just posted in my earlier comment, though maybe not intentionally, has kind of the effect of suggesting you escaped serious injury because of having worn a helmet. It’s a good idea to wear a bike helmet, but to avoid undermining the public’s understanding of solid reasons for wearing one, it’s also probably a good idea to avoid ascribing to helmets, things they haven’t done. Have the police said when they plan to release the identity of the cyclist who was killed? Please see this post for major updates to this story… including charges just released on man who was driving the car. a couple of days earlier there was a story posted about East Portland and its lack of safe facilities. There is a discussion happening about building safe routes and facilities in Outer East Portland, a part of Portland that was annexed in the mid 1990s, and still lacks many features that make safe transportation and livability lag behind the rest of Portland. I noted then, and repeat that this is an equity issue. Much of East Portland could be described as working class and working poor. Greater emphasis on insuring safe facilities is imperative. Many of the folks who cycle in East do so out of economic need as much as other reasons. Design challenges of an auto based transportation model make it more difficult, but not insurmountable. Another poster on that story suggested East should be written off as not practical to provide safe facilities. I disagree. Structural problems that lead to continued injury or loss of life that are not addressed becomes a societal and governance failure that costs the community much more than the cost of dealing with the problem. My condolences to the family of the victim, and best wishes for the recovery of the injured young cyclist. I hope this speeds the desire to make those needed changes in a much more timely manner. Thank you, Joe. I live in “outer east” and ride Division quite a bit because the other options are limited, far out of my way and require changing streets several times, adding lots of time to the trip. Honestly I feel fine on Division east of 205 – there is plenty of space for bikes and it’s well lit at night. Reducing the speed limit would be nice, if it were actually enforced (running red lights is an epidemic on Division that no one seems to care about). It’s sickening to advocate for writing a section of the city off. It is absolutely about equity. Encouraging to see Lt. King correct himself and say “crash” instead of “accident.” That’s something. The first time I rode my bike at night I was so scared I prayed the whole way home. After a few nights, though, I got used to it and eventually came to enjoy riding after dark. There was less traffic. And because I was lit up like a Christmas tree, I felt more visible–and therefore, safer–than in the daytime. As the days grow shorter, I would like to look forward to riding at night again. As this incident illustrates, however, the sense of security we gain from whatever safety measures we might take is too often short-lived. Statistic i came across once stated that after 11:00 PM about 65-70% of drivers are intoxicated, and that rate rises about 10% per hour after midnight… People generally make poor choices after imbibing…what can be done? Vigilante DUI checkpoints? I would completely support random DUI traffic checks at night. Quite common in other states. I’ve never witnessed one in Oregon. The Oregon Supreme Court ruled that DUI checkpoints are unconstitutional some time ago. Where I grew up as a child it wasn’t uncommon to have to through DUI checkpoints during major holidays such as 4th of July. If I’m ever the first to come upon a scene like this, and I’m wearing a helmet, I’m giving it to the victim or laying it nearby, like it got knocked off of him. « silver/gray rayleigh mens mountain bike 1990?